WiFi signal at 20 MHz has a very distinct shape. This shape leads to overlap on other WiFi channels that can be used for setting up access points (AP). 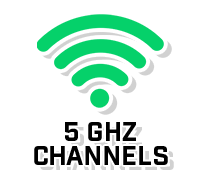 Unlike 2.4 GHz channels, all 25 of the available 5 GHz channels are non-overlapping at 20 MHz wide.